Below is the first part of a collection of door settings for FSX. When these settings are added to an aircrafts .cfg file the jetways and baggage carts will attach and operate. You may be wondering why it is taking me so long to sort out the door settings, part of the problem is the way MS have laid out the gates at major airports, with the same settings you can get this happening..
Ok here is the complete set of AI aircraft I have on my rig. openclose rate percent per second = 0.4 this is the rate that a door opens, if you are adding this to a flyable model make sure that you use the rate that is already in use. longitudinal position= 51.5 this is the position of the CENTER of the door measured forward, a positive figure, or aft, a negative value from the aircraft datum point. lateral position=-5.0 this is the position of the "skin" of the aircraft from the datum point, a positive value is the RIGHT side of the aircraft, a negative value is the LEFT side. vertical position=3.0 this is the position of the CENTER of the door measured above or below the datum point, a positive value is the above, a negative value is below. type=0 0=Main 1=Cargo these are the type of doors in use. The same system is used to position the baggage trucks. 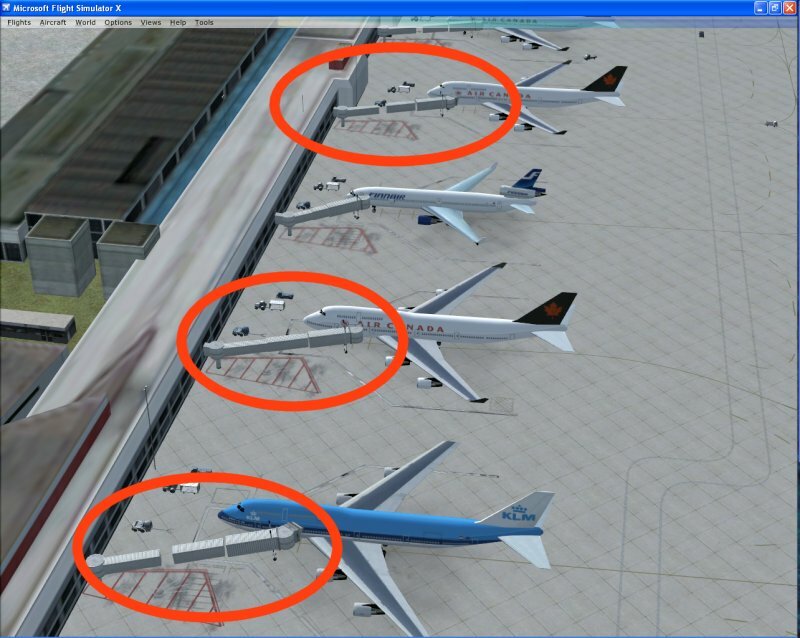 In the example below there are two exits one for the jet way, exit.0 and one for the baggage trucks,exit.1. Thank you for your hard work very usefull file, I'm asking you if it is possible to use your file in an application where you can drag and drop the door settings from your file (i will have to modify it) to a model you can choose from your aircraft folder? I'm starting to write the code to do it for myself, but it will be very usefull to everybody. I did think of doing that but people do tend to change the aircraft folder names for their own so I did not bother, just making it a txt file seemed the easy way to go. If you wish to write something then please feel free!! i'm starting right now i think i will have something for the weekend! B717, B753 and MD90 is not on Door Setting List. Do you have information for this? Oh, I mean PAI B717, B753 and MD90. I'm sorry for not mention that. I do not have the settings for the PAI models as I did not use them, try the AIA settings, they may need some slight tweaking to make them fit. Please explain how these number work for Jetways to aircraft? I'm trying to figure out the setting for Meljet B777-200 LR. What is openclose rate percent per second, longitudinal, lateral and vertical positions from datum (feet)? I will explain for exit.0 in the example you give...the same applies to all exit. * settings. with most aircraft now available only two types of doors seem to be included with them, the main cabin doors and the cargo doors. The open/close rate is the rate at which the door opens or closes, 0.4 makes a door open/close in about 4 seconds. The longitudinal position 55.30, this is the position from the datum point built into the aircraft model, if the value is + then it is forward of the datum point and if the value is - then it is aft of the datum point. The lateral position -7.0, this is the position left or right of the datum point, if the value is + then it is right of the datum point, and if the value is - then it is left of the datum point. The door type in this case is a main exit. The position points refer to the center of the door in question, so in the case above the door is 55.30 forward, 7.0 left and 9.0 above the datum point. The units can be either metric or imperial. The datum point is a position within the aircraft model that the designer has used to build the model from, some designers like to use the center of gravity position and others the nose, and others just a nominal setting. My favorite aircraft are made by Boeing. I see this entry on some aircraft that list "exit.0, exit.1, and exit.2", while on others I'm finding "3" as the count when only "exit.0 and exit.1" are listed. Is this a sum of the exits, or does it define the fact that there are two types of exit on the aircraft (exit and cargo)? Do you have any door settings for the AI Aardvark B737-900? I tried the settings for the AI Aardvark B737-800, and the jetway connects directly next to the door. I also did some searching and couldn't find any. I am afraid the list I made is the final list. You can edit the settings and see what results you get. nice work. do you have the setings to 767-31A? A fewer new ones missing from this list. For instance, the Aardvark 737-900. Are there any revisions that could/ should be added to this very useful list? Most of the revisions to door seeting only need a couple of lines added or edit in the aircraft.cfg file. I did the big list for the release of FSX but I must admit that since then I just have not had the time to get around to revising it. Yes, I understand how they work, and what each parameter represents - you've spelt that out well elsewhere. I am also aware that to do this properly, you need to know the model's datum point (I've never seen this identified anywhere), and the distance from the datum point to the door and hatch (which must be available somewhere, but where? It's pretty obviously NOT the figures for the real plane, because if it was, the figures in FS models wouldn't vary so much from maker to maker). I'd LIKE to be able to create these for more aircraft, but frankly, with so much of the necessary information not in my grasp, I can't see how I can do it. You'll know, perhaps, that I am not a modeller, and only just get by as a painter, so this is well outside of my area of expertise. I'd have thought that the datum can be figured out by using the light parameters as an indication of where it is. At least it'll give you a bit of a start. Also check out this thread for some others. If you don't find what you're looking for, let me know and I'll see if I have them somewhere. I am trying to work out the Traffic 2005 models, which appear to be new models (or at least the textures don't look like any I know). It isn't too important right now, as I ordered a copy of UT2007 yesterday, and will be binning Traffic 2005 as soon as I can install UT. Its me The Fsx a holIc!